The festival of San Fermin begins the 6th of July and finishes the 14th, but during the year, generally the week or two weeks before, different events take place in Pamplona connected with the fiesta; the day of the peñas, for example, which dates from some years back. The first months of the year, on some specific dates, the people from the peñas, have special kind of parties to celebrate that the sanfermines are coming soon. This fad began some years ago and it is called “The stair”. Following the lyrics of the very famous song of sanfermines (“uno de Enero, dos de Febrero, tres de Marzo, cuatro de Abril, cinco de Mayo, seis de Junio, siete de Julio San Fermin. A Pamplona hemos de ir, con una media, con una media, a Pamplona hemos de ir con una media y un calcetín” / “first of January, second of February, third of March, fourth of April, fifth of May, six of June, seven of July San Fermin. To Pamplona we will go, with tights, with tights. 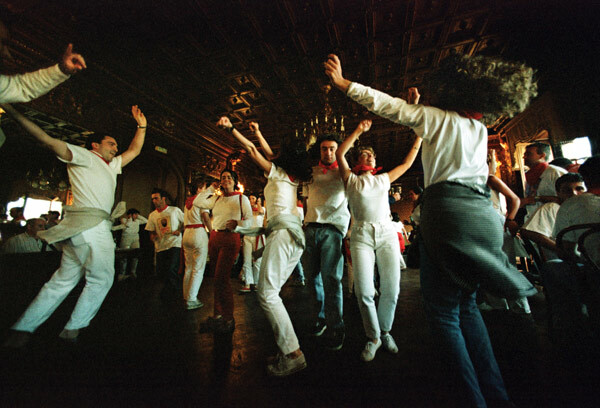 To Pamplona we will go, with a tight and a sock”) the members of the peñas celebrate each month, on a different day the fact that less time remains for the festivals to begin. They meet in their headquarters and prepare a big dinner, followed by a spree that will finish in the early hours of the next morning. This “tradition” starts the first day of the year and continues, as it is said in the song, in different days of the next months. It is not a very observed fad (it’s difficult to remember the dates), but when you see a group of people dressed in white and red, singing the typical San Fermin’s song, you see that the sanfermines are closer. This new fad is just an excuse to have a dinner together and to realize that very soon the awaited festivals will begin again. 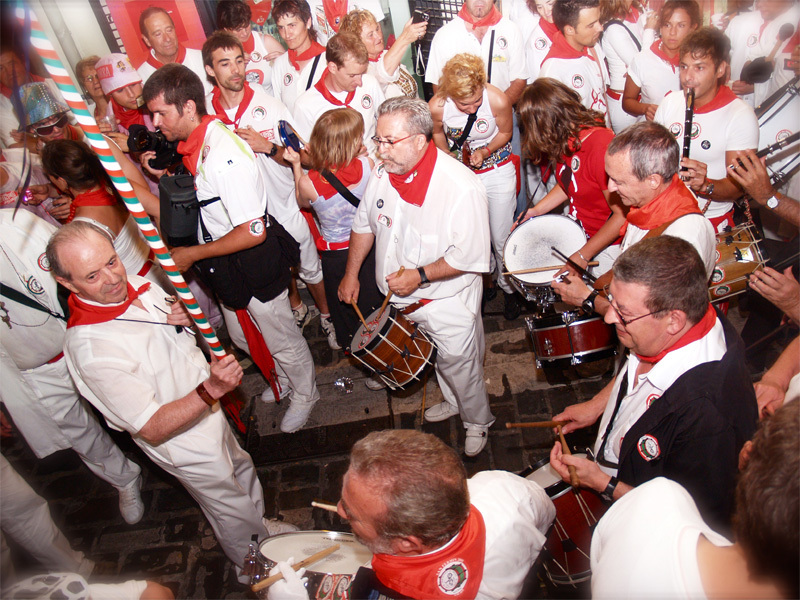 As well as the members of the peñas, some pubs play music of sanfermines in order to have a good atmosphere. Even only for some hours, the people look forward to with the idea of the sanfermines and they start to think how are they going to celebrate them. The Riau-riau is a traditional event where the city hall councilors march from the City Hall as far as the San Fermín, a stretch of some 500 metros in total. This has been an official event ever since 1914 and it lasted up to 1991. In 1997, it was once again revived by popular consensus, although it is no longer on the official program. The rhythm of the march is very slow because there are a lot of people and the tight crowd move to the rhythm of a musical piece – the “Riau Riau” of the Vals de Astráin. The singing and dancing are repeated time and time again and it is interpreted by the city hall brass band, La Pamplonesa with a verbal “Riau-Riau” from the public. The record of the number of times the piece was played was set in 1980 when it was played 181 times in succession. The person who was responsible for this initiative was Ignacio Baleztena and his son relates the original story in the blog de Premin de Iruña. In 1991 the Riau-riau was suspended from the official program after some serious incidents which prevented the city hall councilors from completing the course. In 1972 and in 1980 it had also been imposible to finish the course due to the mass of bodies in front of the procession. But this time, because of the intensity of the incident it was decided to suspend the event. There were attempts to revive the event almost from the beginning, and on other years such as 1996, but without much success. In 1997 some members of the Peña Mutilzarra made some of the first attempts to recover the popular event without the permission of the councilors or political parties. This initiative was backed by some of the old folk’s associations, under the guidance of Patxi García. Little by little this effort gained support from the public and since 2002, the asociación de jubilados Yoar (Pensioner’s Association) have taken over the organization of this event. In 2006 both the City Hall brass band, La Pamplonesa as well as the Comparsa de Gigantes y Cabezudos(The Troupe of Giants and Big-Heads) joined in the event once again and now the event looks very much as it always had, except for the absence of the city hall councilors. In 2012 the act officially recovered but couldn´t complete fully the course. Incidents took place in the City Hall square, and so again the Riau-Riau was adjourned sine die. See an item of news 2012. In 2013 the Mutilzarra Peña Team drives Riau-Riau as unofficial again without the presence of authorities for the July 6 at 18.00 in the City Hall square. Officially, the fiestas come to a close on the 14th of July, but there are those who prolong it into the morning of the 15 th , even creating their own “running of the bulls”. This particular running has its origins in the legendary “Running of the public bus”. With the official fiestas over, this morning bus would once again take up its habitual route by way of the slope of Santo Domingo Street and pass by the now empty bull-pen. The gathered crowd would anxiously await its early-morning appearance. They would sing in front of the niche to the saint (now substituted by an empty bottle) and of course, it was prohibited to shout to catch the attention of the “beast”, etc. This was a tongue-in-cheek disrespect to the established order for having brought the fiestas to a close. And the established order was not amused. So it has done all it can to stop this “running in front of the early-morning bus”. The bus schedule was changed to ensure that it would not run at that time. But for some people it didn’t make any difference. They just ran in front of whatever vehicle made an appearance – perhaps a delivery truck heading for the nearby public market or indeed, any vehicle that came up Santo Domingo Street . Lately, the thing has changed somewhat. Now the crowd run in front of a cyclist (dressed in his proper gear, of course) or someone dressed up in a “bull” suit. And there are some homilies sung to the saint, to whom some have given the name of Holy Patron of the 15 th . It would seem that it is a saint somewhat “under the weather” and very much alive, who parades about after the “Pobre de Mí” closing ceremony and goes about blessing the people until the early-morning running takes place. 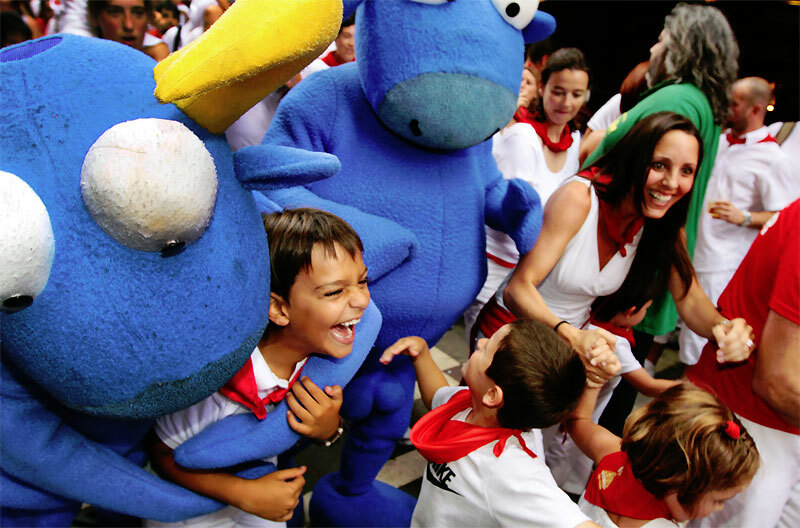 Kukuxumusu has managed to get a long-aspired event up and working in the fiestas, a children’s running of the bulls. The bullrunning is starred by Mr. Testis and his fellow teddy-like bulls. Twenty-four long years since the last children’s running of the bulls took place when it was held with some young novice bulls, Kukuxumusu will host a special running for the kids with “stuffed” bulls of two meters high. The popular Mister Testis, alongside some of his fellow teddy-like bulls, will run a stretch of 200 meters – the distance that separates the two stores which Kukuxumusu has in Estafeta Street. It´s free, gratis, and you don´t need register before. The event will contain all the classic ingredients of the original running of the bulls; a homily sung to the saint before the run begins, the presence of the pastores or “minders” with their long sticks to control the bulls; a rocket will be launched to announce the opening of the gates, and above all, there will a great fun atmosphere for all the kiddies. Pamplona City Hall has given the official go-ahead for the celebration of the event and it is open and free for all those kiddies who wish to take part in the kids’ running of the bulls. You can see Sanfermin´s programme to know the exactly date & hour of the running of the kid´s. Kukuxumusu bestows each year the “Guiri del año” (foreigner of the year) award, in acknowledgement of the wild set of foreigners who come to Sanfermin. Kukuxumusu loves the have the foreigners come to town. That’s why, ever since 1996, it organizes a “Guiri Day” for the foreigners in homage to the foreigners who come from all over for the fiestas. In this way, Kukuxumusu wishes to recognize their contribution to the fiestas and show the real image of these many foreigners. Without them the party would not be the same. In 2004 an award was created for the “Guiri del año” (foreigner of the year) where the stimulus of some particular foreigner to the Sanfermin fiestas is acknowledged. Each year Kukuxumusu travels to that person’s country to hand over the award. The award is made up of a kind of commemorative figure of a globe with horns Then, during the fiestas a special meal is held for the winner which is attended by the previous years winners and some representatives from Kukuxumusu. Here, although many different tongues are spoken, everyone understands each other perfectly. 2005 – Lore Monnig. USA / Estados de Unidos de America. The dance of the Alpargata is perhaps the earliest dance to take place anywhere around the world. It starts at 9.00 in the morning, each day of the fiestas, and it takes place in the Casino Principal club, at no. 44 Plaza de Castillo. Basically it consists in dancing as its name indicates. It gives the all night party-goers an excuse to continue with their partying while it also attracts the early risers who have got up to see the running of the bulls. The dance has got its name from the traditional footwear that the peasants used to use, and in those years they would have got together to dance with this kind of footwear. The event tends to attract some of the most important names in the city. This is because the club is private and so admittance is limited to members or to their guests. But it is worth making an effort to see if you can get in, if only to see a kind of atmosphere quite different to what you will see in Jarauta or in San Nicholas. The human running of the bulls was celebrated during six consecutive years by PETA. A few months before Sanfermin 2008, this organization announced that it was changing its policy of awakening cruelty-to-animals consciousness and it would not be present at Sanfermin until further notice was issued. Their contention was that these gatherings for the human running of the bulls served only to bring even more international media coverage of the event which only led to more people coming to the fiestas – something which was counter-productive to their aims. Since then, they have chosen other venues around the world to make their protest against bull fighting and the running of the bulls. In 2008, their place was taken instead by Animanaturalis who made a protest outside the bull ring with some 60 people stretched out on the ground dabbed with red paint as if they had been stabbed by banderillas. Their protest was more obviously against cruelty in the bull ring. In addition, on the 12th of July, 2008, eight members of the anti-bull organization, Equanimal, managed to slip past the fencing and get onto the course of the running of the bulls to try to prevent the event taking place. The local police quickly broke up the protest and the running of the bulls took place without any further problems. 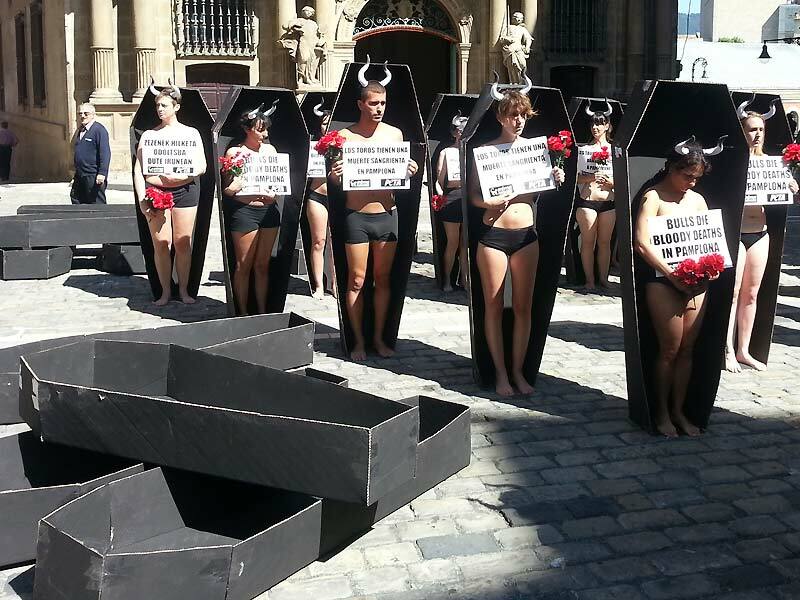 Between 2002-2007, each fifth of July saw the presence of PETA (People for the Ethical Treatment of Animals) in Pamplona. During each of these years they organized a very original running which was meant to emulate the traditional running of the bulls. Their aim was to protest against the use of animals for human diversion. Their particular run started at the Puente de Curtidores Bridge at one o’clock in the afternoon. From there it made its way up to Santo Domingo. For security reasons, the route was always diverted here by the local police and the protestors had to march behind the old public market site behind the Town Hall and up to The Labrit slope. After reaching the bull ring, a speech was read out at the entrance to the bull ring. What caught everyone’s attention about this protest was the fact that most of the participants marched naked or semi-naked. As the event proved to be entertaining, festive and pacific, the Local Government authorized the march and supervised the security of the marchers. The human running of the bulls as the event was called, achieved a lot of mention in the media as this kind of naked protest was so unusual. Year after year, more and more people joined the PETA protest so that the number of participants increased from 20 -odd people in the first year to hundreds of participants in 2007. This is just another annual tradition which doesn’t get a mention in the official guidebook, but which has become an annual tradition. There is no fixed date for it ; it usually takes place in the middle of the week late at night, once the initial explosion of the first days has been got over. It started some thirty years ago and the idea is that a crowd collects behind the Town Hall with any kind of musical instrument or anything that can make a loud noise, and they set off on parade through the streets. Anybody can join in, grap a drum, or whatever and get down there to the Town Hall about 12.00 midnight. At this hour they always play the traditional piece _ Agur Jaunak, and then set off round the nearby streets. They always finish three or four hours later at the little well of San Saturnino, half dead and half sloshed (from the many stops for refreshment made along the way). The popularly known “Garlic Square” in Pamplona is, in fact, properly called The Plaza de las Recoletas, no matter how often the people might refer to the place as “Plaza del ajo “or” Garlic Square”. The nickname arose from the fact that strings of garlic have long been sold from stands in this square during Sanfermin. And it only became city hall property in 1974 when City Hall bought it. And the proper name was bestowed on the square because the convent of the Agustinas Recoletas (The Order of Augustinian Nuns) resides in the square. As coal was also long sold from premises in this square, it also acquired the name of “Coal Square” as well as that of “Garlic Square” in the popular vernacular. Nowadays there is little garlic and less coal sold there. During the 1950’s and even 1960’s of the last century there were up to 26 stands selling garlic during Sanfermin. The high demand for stands meant that the outlets were auctioned and in 1967 as much as 42,000 pts was paid for some of the best sites in the square. Whole strings of garlic used to be bought by the public and many of the young men would wear them around the neck during the Sanfermin fiestas before taking them back to their villages as presents after the fiestas where they would be hung above the kitchen stove. Nowadays the wholesaler could be bringing in garlic from many different locations. But in the old days the garlic from Falces and from Corella had a special fame. Some families have been bringing their garlic for many generations to be sold in this square, such as the Izquierdo, and the Martinez. Pedro Martinez, from Tudela, continues to bring his strings of garlic to Sanfermin each year. The Hemingway Days are celebrated each year in Key West (Florida) to commemorate the birthday of Ernest Hemingway. Every July in Key West (Florida) the birthday of Ernest Hemingway is commemorated with a fiesta in his honor, under the title of The Hemingway Days. In order to commemorate the birthday of Ernest Hemingway (21st of July, 1899), Key West (Florida), a place he spent a large part of his life living in, celebrates each year a fiesta in his honor: The Hemingway Days. In 2014 they celebrate the 34th edition of this annual event, where dozens of lookalike Hemingways take part in a lookalike competition and also run a kind of Running of the Bulls as a salute to the Sanfermin fiestas which Hemingway admired so much. The Hemingway Days are celebrated every year in the Sloppy Joe’s Bar in Key West, an establishment that was frequented so often by Hemingway whenever he was in residence there. As well as holding a Running of the Bulls, the celebrations also include some literary talks, readings, book signings, a three-day marlin fishing competition and an award-giving ceremony with a competition of short stories, which was an initiative begun by one of Hemingway´s granddaughter´s, Lorian.